Natural zoogeographic distribution of the trace-producing endobenthic organisms with reference to environmental attributes and geomorphic features primarily control the distribution and relative abundance of their traces or lebensspuren that define distinctive ichnological zones (or ichnozones) and constituent subzones. Two broad environmental ichnozones, named as coastal and lower estuarine ichnozones, have been recognized in the study area. These zones include subzones defined by specific organism(s) and their traces. 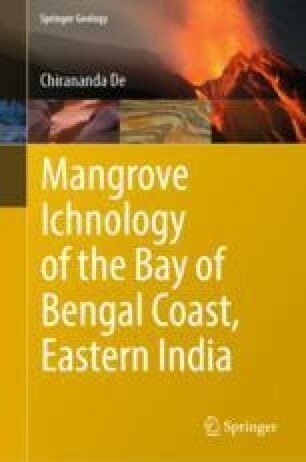 Most of the Bay of Bengal ichnozones and subzones are attributable to diagnostic coastal subenvironments and geomorphic settings. For example, Uca-Turritella-Telescopium subzone of the backswamps and upper intertidal pellet spread subzone within the coastal ichnozone. This chapter deals with detailed characterization of the ichnozones and subzones with the help of wide field database that includes location maps of the sampled lebensspuren and representative ichnoprofile sections across the five reference beach sectors.